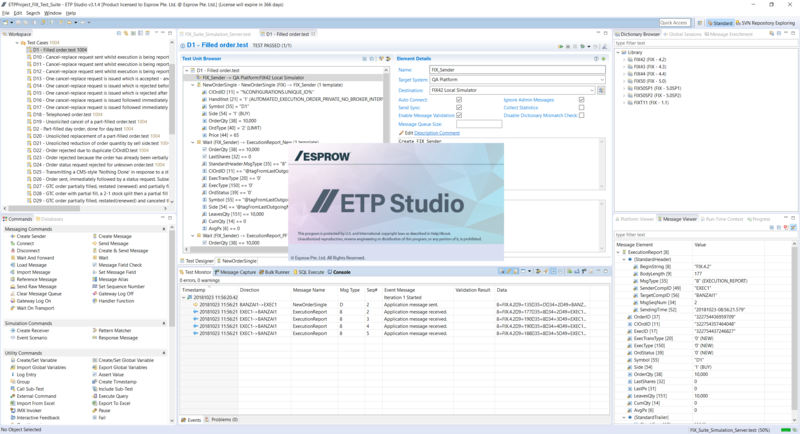 In this new era of rigorous regulation and shorter testing windows, Esprow ETP Studio for FIX provides a complete toolset to automate testing of FIX-based systems. Designed around the needs of technical and non-technical users, ETP Studio for FIX can be used for testing of FIX sessions, build complex suites of test scenarios or replay large and complex production log files. ETP Studio for FIX: our main environment to manage FIX sessions, maintain FIX specifications and build test scripts. FIX Order Book Manager: add-on functionality to manage orders, executions, render ATDL files and subscribe to FIX market data. FIX Exchange Simulator: a complete exchange simulator on your PC - accept/reject/fill client orders, and much more. FIX Performance Package: test commands designed to stress-test your FIX system and collect performance statistics. FAST Protocol Plug-in: a complete toolset to test FAST protocol connectivity. FIXML Protocol Plug-in: a complete toolset to test FIXML protocol connectivity. Modernize your FIX testing. Give your team a modern testing framework.